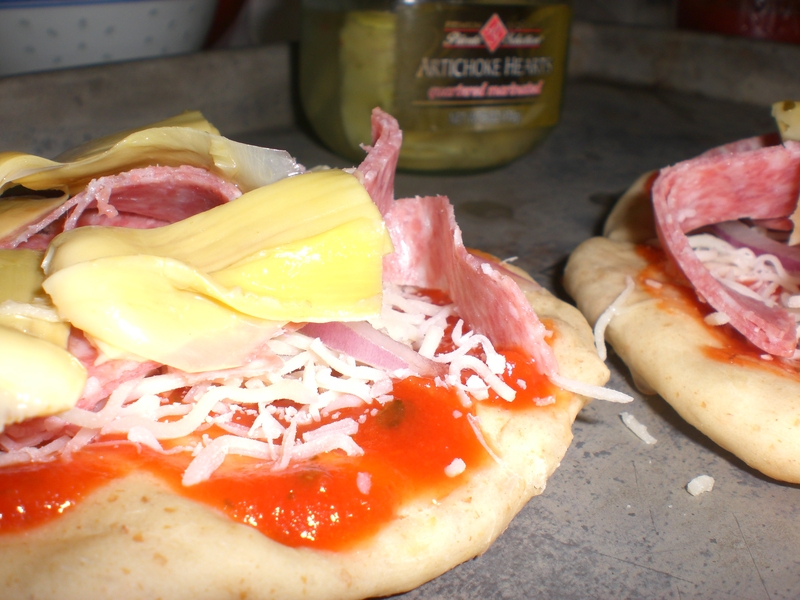 Mini pizza with salami, onions and artichoke hearts. When I was a kid, my dad would make homemade pizza when my mom went out of town. We would get mix from the grocery, Appian Way brand, which if they still make it, is not available in my local megamart. It was quite the production, making enough pizza for 8 people, which is probably why my dad did it when my mom was out of town. It was always one of my favorite meals. Now that I am a grown-up, homemade pizza is still one of my favorite meals. I don’t use a kit, I use a dough recipe that I think originally came from Better Homes and Gardens. I haven’t altered it beyond adding 1 cup of whole wheat flour, but I have lost the original clipping, so that’s why I don’t know the source. What I usually do is make the dough, and shape about half of it into rounds and bake them for 5 minutes, then we can top them with whatever we like, then bake again. What I love about minis is that everyone can have the toppings that make them happy, and we don’t have to pick peppers off mine, or meat off the boy’s. We’re picky. Pour water over yeast and sugar, let sit a minute while you get the other stuff ready. Add 2 cups of the flour, olive oil, and salt, and mix with dough hook (or by hand if you don’t have a mixer:(. Gradually add remaining flour, and knead about 10 minutes total. Let rest- you can let rise about 40 minutes, and punch down, but I often just let them rest while I get the oven preheated, and work on the garlic butter or pizza toppings. With the other half of the dough, I have started making garlic twists, according to the directions from the Frugal girl blog. http://www.thefrugalgirl.com/2010/06/wednesday-baking-italian-cheese-twists/ The first time I used the recipe, we ate up a dozen of them before DH got home from work. He came home to a house smelling like garlic bread, and only had one measly stick left… If I am planning far enough in advance, I’ll do the garlic sticks and spaghetti on a non-activity night, and prebake the pizza rounds while the oven is on. Then I bag up the pizza rounds, and we can decorate them a day or two later, when we are getting home from soccer and starving. One last note- what makes this recipe, and most of my bread projects, possible, is that DH got me a Kitchenaid stand mixer a few years ago for Christmas. One of the best gifts I’ve ever gotten.